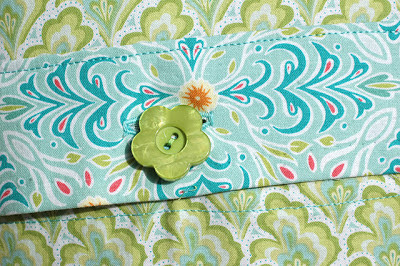 Note: The winner of the previous giveaway was Carol Ann, who said, I made Amy Butler's Frenchy Bag for my niece out of The Lorax fabric, it was so darn cute! I love your table runner! Next up in my Bernina 780 projects is my Fizz pillow with CrystalWork accents. 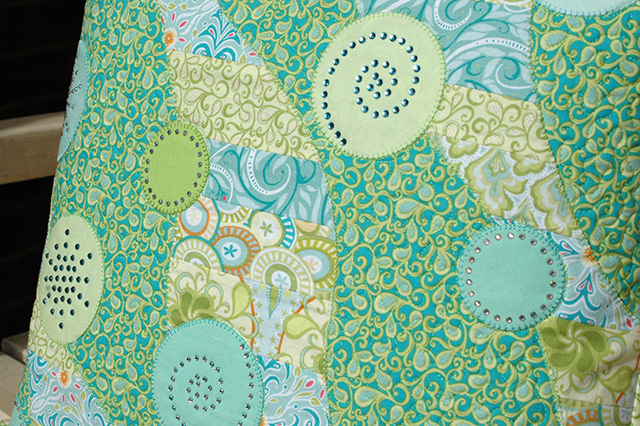 It is a modification of my Fizz quilt pattern and features my "Seaglass" color story from my Bella collection for Blend Fabrics. I had SO much fun with this project! The crystals really brought the finished piece to a whole new level! And they were so fun and simple to apply. I just made a few templates using the DesignWorks software and CrystalWork tool and reused them again and again to add sparkle to the bubbles! 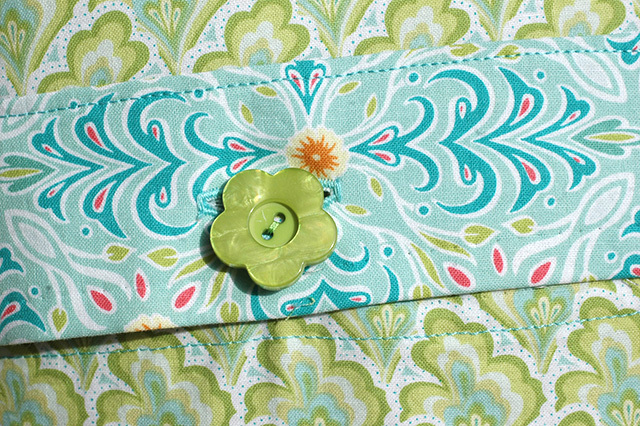 Like on all Berninas, the buttonhole feature is so easy to use and sews beautiful buttonholes every time! Want to see more? Hop on over to Youtube and check out the Fizz video! And I think we should have a giveaway for this too, don't you? 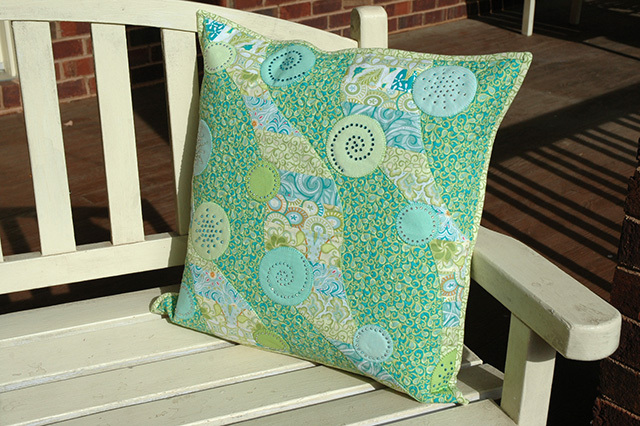 This time I'll give away a copy of my Fizz pattern this time, along with three fat quarters of Bella. To enter, just leave a comment on this post telling me about a project in which you might use CrystalWorks for added bling! Again, one entry per person and I'd love for you to become a follower if you aren't one already, but it isn't a requirement. Deadline to enter will be this Thursday (the 20th) at midnight. I have some other big news tonight. I'll be back soon! I would use some CrystalWorks on a dance bag for my niece and it would add some bling! I would make a little white dress for Xmas 2013 for my grandaughter who will have just turned one and i would put crystals on the yoke in a snowflake pattern! I am thinking white fabric pillows with some of the sweet bling on it for my black settee in my sewing/sitting area in the studio. You still leave me awe struck my friend. I know your must be all atwitter with the book and new line etc. I know what I would do with Crystal Works, I would decorate handbags and wallets. And I would add just a couple to a pillow like you made or add them to a wall hanging. I just bought this Bernina 780 for Christmas!! I'm so excited to make some of the things you made but I need a pattern. Maybe I will win. Thank You. That is really great. My daughter is all about the Bling so I'd use it everywhere I could to make her world just a bit more beautified. I'd add bling to just about everything if I had that nifty tool. Christmas ornaments would be fun with that extra sparkle added by the lights on the tree. My daughter would love a bag decorated with some crystals! I need to make a new bag with a tutu going around it for my grand daughter to carry her shoes to class and that would bling it up. She would love it! love the crystals on fizz! I would use CrystalWorks on a purse or bag to bling it up. I love Bling. Can't wait for the book to come out, Congratulations! The Fizz pattern is on my wish list, I am trying for the entire collection, love your patterns. I wouldn't know where to start with a fancy machine like that, I have a very cheap machine, but it does the work I want it tonow. I think using it for pillows would be fabulous! Thanks for the opportunity to win! i would bling-out a small purse. i follow you through email notices. love this fabric! 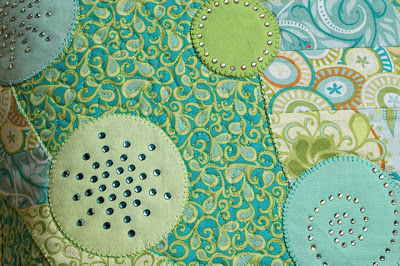 I'd add some bling, as a fun little touch, to curtains I'm planning on making for my new guest room and bathroom. Thanks for the sweet giveaway! Well, I have a thing for bling ;) and I have the tool and crystals in every size and color. I agree with all the projects above, plus you can bling out plain sneaks, baseball caps, fabric postcards, and make personalized stationary for yourself and for gifts. It only takes a few to add the sparkle surprise. Love your seaglass colorway as I have vases full of seaglass we collected from beaches in Italy and Laguna Beach. Also like your Fizz pillow. 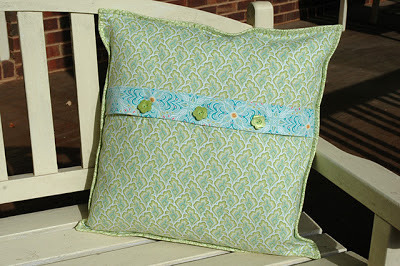 We have a new sofa and I've been searching patterns to make my own decorative pillows. Merry Christmas Amanda. I have seven granddaughters here in town that are all enambored with bling. And a grandson that loves crystals on his boy shirts. Skirts, shirts, just about anything looks better with sparkle. Thanks. So pretty! I would use the CrystalWorks bling for adding that "something special" on a pillow for my daughter's bed. She is 9 yrs. old and I need to design her room around the couple quilts I made for her a couple years ago. What an amazing feature.I just watched the Utube video.If I had this feature I would makes some awesome bags and decorate them.Then I would make pillows and decorate them too. That pillow is too cute! I made a pillow for Christmas this year that is an appliqued tree branch with an ornament hanging from it. I think the crystals would look wonderful on it, either as snow on the branches or on the ornament itself! I have a messenger bag pattern I want to make for my daughter and I think that it would add some pizzazz! I would love to applique a Christmas tree and decorate it with multi colored crystals. I have test driven the 780 and just LOVE it....but since I already have the 830..... I can't justify another high end machine. Lucky you...that you get to play with one. Thanks for the giveaway and I happily follow your blog. Merry Merry Christmas Amanda!